The other night we had friends over for Bad Movie Night. We played a round of Apples to Apples and then settled in to watch Re-Animator. It was definitely a hokey, bad B-movie classic. Bad acting, bad effects and an over-the-top plot. Because we were hosting on a Friday night, after a full day's work, I wanted to keep the menu simple and easy to do ahead. Five spice pork lettuce wraps and raw veggies for dinner followed by chocolate black-pepper cookies and homemade salted caramel sauce with vanilla ice cream. My aunt and uncle have made this for us a few times and it's so good and perfect to make ahead, I think it's even better than cooking it on the same day. Making it the day before means you can refrigerate it, and skimming cold fat off of a recipe is always much easier than tediously spooning off liquid fat. 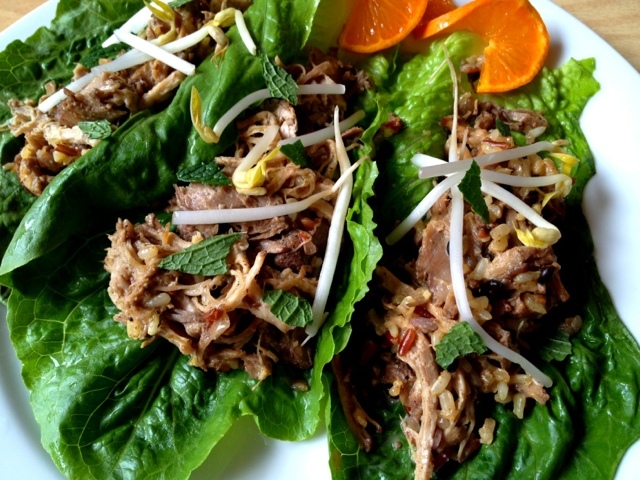 I used homemade hoisin sauce in the pork recipe and to serve the wraps with. I subbed almond butter for the peanut butter and used honey instead of molasses, and it turned out quite well. For dessert, I made Chocolate Black-Pepper cookies from Martha Stewart's Cookies. I made the dough the weekend before and froze it until the night before the party, so I could bake them off for the next night. For the salted caramel, I used another Martha Stewart recipe from The Best of Martha Stewart Living Cakes & Cupcakes, it keeps for quite a while in the fridge, so it's another easy thing to make ahead. Then I just served the two with good vanilla ice cream to round everything out. Sift together flour, cocoa, salt, pepper, espresso powder and cinnamon into a large bowl. Cream butter and sugar in your stand mixer on medium until pale and fluffy. Add in egg and vanilla. Reduce speed to low and start adding dry ingredient mixture. Mix until combined. Turn out dough onto parchment paper and roll into a log and roll up in the parchment. Refrigerate at least 1 hour (or freeze for a week, like me). If you've frozen your dough, remove it from the freezer a couple of hours before you want to bake the cookies, if it was in the fridge just set it out for about 5 minutes. Preheat oven to 350 degrees. Roll log in sanding sugar and slice into 1/4 inch slices. Place on baking sheets lined with parchment or silpats. Sprinkle with black pepper. Bake cookies until the center is just set, about 10 minutes. Cool on wire racks. Combine sugar, corn syrup and water in a medium saucepan. Cook over high heat, washing down sides of pan with a wet pastry brush to prevent crystals from forming. Keep brushing until sugar is dissolved and then continue to cook without stirring. Seriously, don't touch it. Cook it until it is dark amber and then remove from heat. Carefully pour in the cream and stir until smooth (it will spatter and steam, so watch out). Put back on heat and cook until it reaches 238 degrees (I didn't have a candy thermometer, so I just put in for a couple of minutes, until it bubbled for a bit). Pour caramel into medium bowl, stir in salt and let cool slightly, about 15 minutes. Stir in butter, 1 cube at a time and cool completely. This makes quite a bit of caramel sauce. I've used it as a filling for a cake and the sauce for this party and on random things for a couple of weeks, and I've still got some left.